Pair of coyotes passed by while I was walking through the Rio Vista Natural Resources Park this morning. Photo below shows the second one off to left side behind the tree. Real Rain Event On Horizon? Today, the final short wave associated with the large 500 mb cyclone that moved into the Great Basin this week will be crossing along the Borderlands of Arizona/Mexico. The WRF forecasts from Atmo indicate a slight chance of sprinkles and showers later today, but mainly off to our east and south. We will then have to look ahead toward the end of the first week in April, as we still hope for a rainy period before the hot and dry weeks set in before the summer thunderstorm season. The operational forecasts from the GFS model are shown here way out at 5:00 pm MST on April 7 - a week from today. The 500 mb forecast (above) indicates a system moving into the Southwest from low-latitudes, bringing with it a very nice plume of subtropical moisture. Wouldn't this be a great change? The model's forecast of accumulated precipitation through the same period (below) indicates a widespread and significant event for most of the Southwest. This would be the first such event since the first week in January. Although, in the model forecast world there have been several false alarms during past months, all out at seven days and longer. A look at this morning's QPF plumes (above) shows the ensemble members (at least a majority of them) forecasting decent rainfall at TUS. However, there's another caution here - note that the operational version of the model (blue) is one of the wettest members. This happened back in late January also, and as that event approached, the operational model reverted to its usual dry mode, as the event slowly fizzled. The evening runs of the WRF-GFS at Atmo usually extend out to long time periods also, and here are the forecasts valid at 5:00 pm on April 7th. Above is forecast of composite radar echoes and below is forecast of accumulated precipitation within the model through that time. It is the operational member of the GEFS that is driving these high resolution forecasts, so we'd expect something like these outcomes. Hopefully, this future event won't fade away during subsequent forecasts early next week. The 06 UTC forecasts last night from the GEFS and Atmo's WRF-GFS continue to hold out some chances for sprinkles through April Fools' Day. The GEFS QPF plumes above show wide ranging timing and amounts from zero to a bit more than 2/10s of an inch at the airport - possibilities all over the place, so it's hardly a simple coin-flip situation. The WRF-GFS forecasts light echoes over southeast Arizona late Thursday and Friday morning - below is composite radar echoes forecast at 3:00 am MST on Friday. At bottom is the model's forecast of total precipitation through 11:00 am on Friday. Certainly not much of an "event." A large and cold closed-low at 500 mb is digging southward this morning from the Northwest, following a mostly overland track. The 500 mb analysis above is from the 12 UTC NAM this morning and shows a kidney-bean shaped low with circulation centers over the northwest corner of California and over northern Idaho. The models continue to forecast this low to remain elongated, with a positive tilt, that eventually leaves behind a separate but weaker system over the Southwest. The main impact from the large, initial system will be winds and dust - as per the current morning forecast from the NWS for the airport (above). Note that there is a Red Flag warning in effect for southeastern Arizona - as usual ignore the warning area shown on the NWS Homepage and click on Hazards if you want to see the actual area being warned. Below is Atmo's WRF-GFS forecast from 06 UTC for 10-m winds (in knots) valid at 2:00 pm MST this afternoon. Note that 24 kt equals 28 mph. The GEFS forecast plumes for TUS are essentially mirrored by the NWS forecast shown above. The QPF plumes from the 06 UTC forecasts (above) indicate an anemic system (as per other systems last several months). Most members forecast a slight chance for up to 0.02" at the airport, with a few members being slightly more optimistic - timing of shower possibilities within the ensemble is all over the place. The plumes for 10-m wind speeds (directly below) forecast the next two afternoons to be windy. The temperature plumes (second below) indicate a fairly strong frontal passage sometime tomorrow morning, with afternoon highs about 20 F or so colder than those forecast for today. Finally, the GEFS average 500 mb height forecast below is for 5:00 pm MST on Wednesday the 30th. The portion of the system hanging back over the Southwest seems to have some possibility to pick up a bit more moisture, due to longer fetches over the ocean - so it will be interesting to watch how the PW evolves between here and Hawaii late Tuesday and Wednesday. The Western Pipestrella bats that summer up in the crevices next to the vigas on our front porch apparently showed up yesterday, March 26th. Katie and I were sitting out a bit ago, and I saw one head out into the dusk. So, what's the mystery? 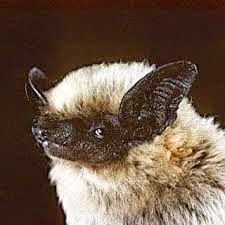 Even though this has been the warmest winter ever, the bats are late. Last year they arrived on March 11th, but this year they have appeared a bit over 2 weeks later than last Spring. Why? PS - the geckos are out in force hunting around the outside lights also - but I apparently didn't note when they first appeared last year. As March Winds Down Anything More Than Wind And Dust? 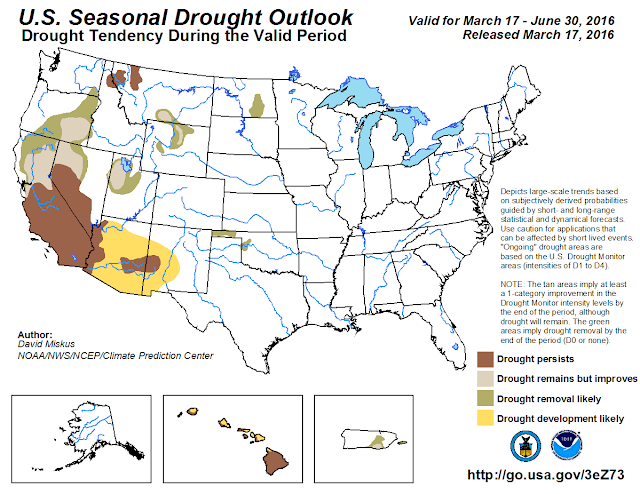 The extended period of distressingly dry weather continues across southeastern Arizona and much of the Southwest. Here at the house I've measured only 2/10s of an inch of rain since January 8th (that's almost 80 days). So the question as March comes to an end is whether we'll have some showers at mid-week, or if it will be just some more wind and dust. The panels above and below are from the 00 UTC run of the GEFS last evening and are valid at 12 UTC on April Fools' Day (i.e., at 156-hours out). The average 500 mb heights (above) indicate a very daunting, blocking ridge over much of the West that extends northward across Alaska and into Siberia. The U.S. weather action continues to be happening mostly over the eastern 2/3rds of the country. The spaghetti plot for 500 mb at this time (below) shows surprisingly little spaghetti on the Northern Hemisphere plate, considering that this is out at 156-hours. The southern branch of the flow continues strong but is still shifted southward into and across northern Mexico. The forecast of total precipitation through 12 UTC on April 1st is shown below from the operational member and presents little hope for a real break in our very dry period. A few of the ensemble members do indicate a slight chance of spits and sputters of rain right at the end of the month. So, basically a time to enjoy the amazing weather and the early Easter weekend. About 7 days ago I showed the GFS and ECMWF operational forecasts that were valid at 12 UTC this morning. These forecasts are at the top and bottom here, with the NAM 500 mb analysis for 12 UTC this morning just above. neither global model was very accurate for this event at 192-hour. The GFS was too fast and forecast a very elongated system from northeast to southwest. The ECMWF was very much too slow, showing almost a "locked-in" type closed low over the Southwest. The height errors in the forecasts are probably more severe for the ECMWF, because of a strong too-high and too-low couplet over the Northwest to Southwest U.S. The actual storm system was considerably more intense than the models indicated, producing serious winter weather impacts from Colorado to Wisconsin, and severe thunderstorms from Texas to Missouri. At long time frames an average of the two operational models was probably closer to reality. 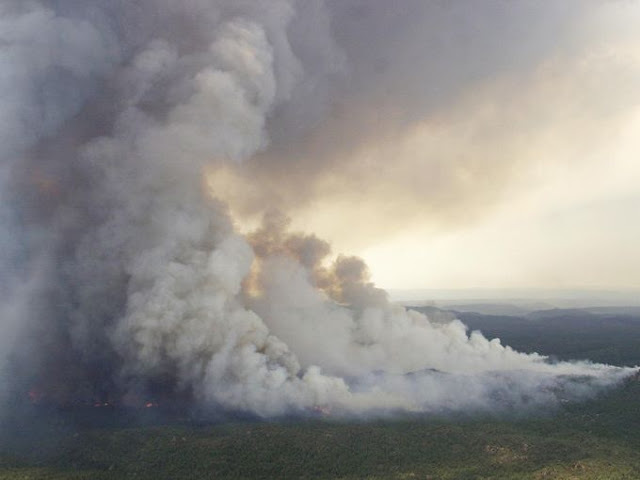 Yesterday's strong winds spread a wildfire east of Douglas rapidly yesterday afternoon - photo above. The Baker Canyon fire is in rugged terrain near the New Mexico border. Winds gusted 30 to 50 mph over much of Arizona yesterday. Strongest gusts that I noted in observations from yesterday afternoon were: Winslow 63 mph; Pioneer Airfield 56 mpg; and the Guthrie RAWS site 51 mph. Meanwhile, much of northeastern Colorado is closed today due to heavy wet snow (after temperatures in 70s F yesterday). 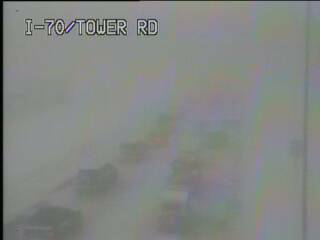 Above web can shows I-70 at Tower Road near DIA airport, which has been seriously impacted by the storm. Photo below is from downtown Boulder. A nice lenticular, with a bit of iridescence, was standing just downwind of the Rincons while I walked this morning. Main weather event for southeast Arizona today is wind. Just below is 12 UTC WRF-GFS forecast of 10-m wind speed valid at 2:00 pm MST. At 1:00 pm winds were gusting generally over 30 mph across southeast Arizona - TUS 35 mph; FHU 39 mph; and Pioneer Airfield 43 mph. Graphic at bottom shows today's wild fire outlook from SPC. Jack Diebolt forwarded these graphics along the other day. The current NWS CPC outlook for precipitation for July through September is shown above - this will undoubtedly be of "great" value to planners of all sorts. The CPC outlooks extend out through Summer 2017, if one wants to check the very long term. 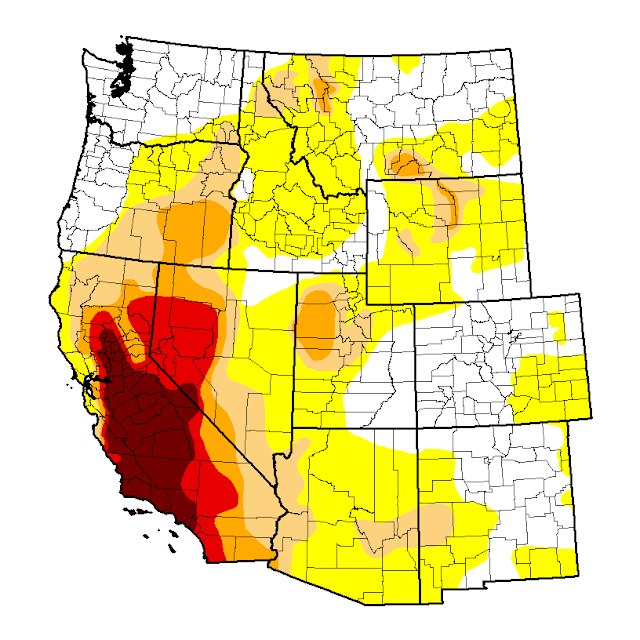 The current drought monitor analysis is shown above and indicates that extreme to exceptional drought is mostly gone except for a considerable portion of California and a bit of Nevada. The current drought tendency for mid-march through June is shown below - it seems to indicate that drought returns to much of Arizona. However, much of the area covered by the brown and yellow shading is about to experience their driest season of the year - one where average rainfall totals less than an inch for that quarter of the year. Hard to accept that the "trend" during the hottest and driest three months of the year means much wrt the long-term. In fact, the products shown in this post should probably have a mask applied to the very dry deserts of the Southwest, where the products have little physical relevance. Finally, if you are skiing in northern Utah, you should just stop looking at seasonal forecasts altogether. SEASONAL OUTLOOKS ARE UTTERLY AND TOTALLY VALUELESS FOR ANTICIPATING WHAT KIND OF SKI SEASON WE ARE GOING TO HAVE IN NORTHERN UTAH. Next October, don't waste your time on this stuff. Wax your skis and be happy. It is spring break at the University and we have been off on several day trips that are briefly highlighted here. 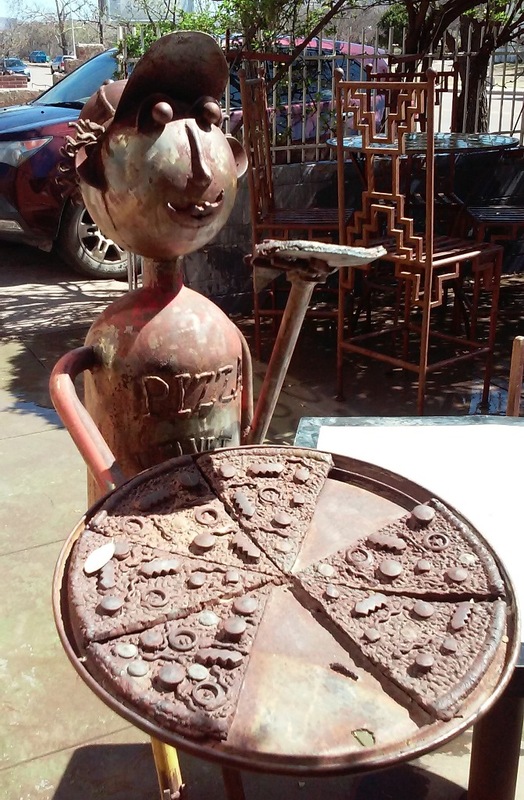 Last Saturday we drove a loop through Sonoita, Patagonia, and Tubac. We had lunch at the Velvet Elvis in Patagonia - above and two photos below. This place has been in business since the late 1990s and is well-known for artisan pizza - as per the metal sculpture at the door. We definitely recommend a stop here. On Tuesday we headed west toward Sells and lunched at the Desert Rain Cafe. 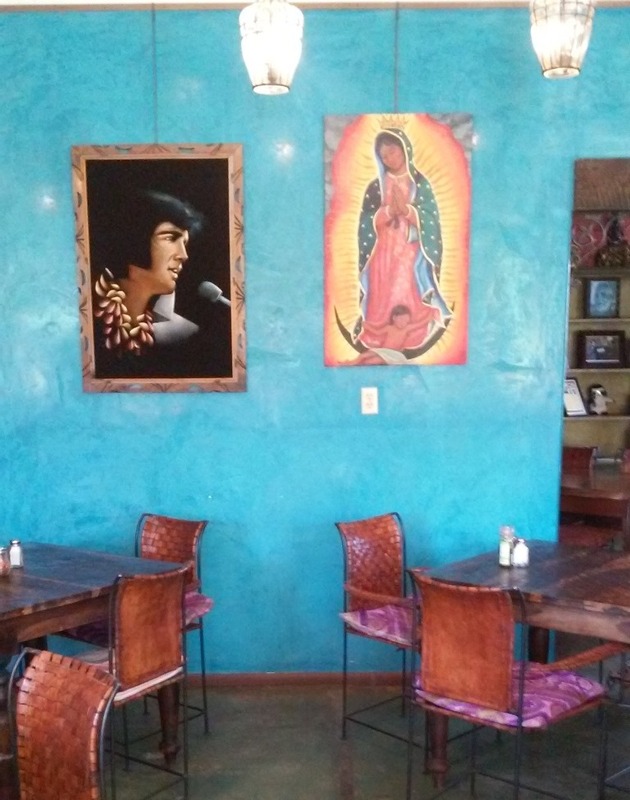 The Cafe is run by the Tohono O'odham Nation and specializes in Native American preparations, many of which feature things like tepary beans, cholla buds, and prickly pear fruit. We recommend a stop there, although it is certainly off the beaten path. Note the weather theme in the metal work above, along the dining patio. Although the landscapes out that way were dominated by brown, there were some wildflowers in bloom along Highway 86. Above is a shot of the Tohono O'odhams' sacred peak - Baboquivari - taken from the east in the Buenos Aires National Wildlife Refuge, which is another interesting place to visit, that is also well off the beaten path. As we headed back to I-19, we stopped to take photos at the famous cow skull restaurant in Amado - below. Think of Martin Scorsese's 1974 movie Alice Doesn't Live here Anymore. Unfortunately, the place has been closed for several years, so no interior shots. The main aggravation of these trips was observing, up close, the extreme budgetary excesses of the U.S. Border Patrol. Many tens of huge vehicles roaring up and down the roads and highways every few minutes; numerous new facilities; and about five seemingly over-staffed and onerous checkpoints. Our overall impression is that this is an agency that is seriously out-of-control! Will start with a look at outlooks from the NWS CPC, and then follow with a comparison of the 192-hour forecasts from the operational versions of the ECMWF and the NWS GFS. Graphic above shows the CPC precipitation outlook for the month of March - as per their products beginning last Fall, the forecast has been for a typical El Nino pattern. This has seemed to be plow-ahead type forecasts, despite what has been observed. Graphic below shows latest CPC 8-14 day precipitation forecast - about as different from the monthly outlook as one could imagine. These shorter term outlooks are very much driven (apparently) by what the current global long-term model forecasts are indicating. Second below is the operational GFS forecast of total precipitation through the next 10-days - very grim for our part of the world. Even with the strong El Nino signal, the CPC outlooks have demonstrated that coin-flipping is about as accurate as their products. Of interest is a very substantial difference between the operational 500 mb forecasts this morning from the ECMWF - above - and the GFS - below. The ECMWF holds out some hope for a precipitation event for southeastern Arizona, while the GFS continues with a dry pattern. Second below is the GEFS plumes forecast for QPF - which is seriously flatlined through 192-hours. Will be interesting to watch how this difference between ECMWF and GFS plays out. The day has dawned mostly clear, with some clouds hanging on the Catalinas, and the cool front has already passed by. 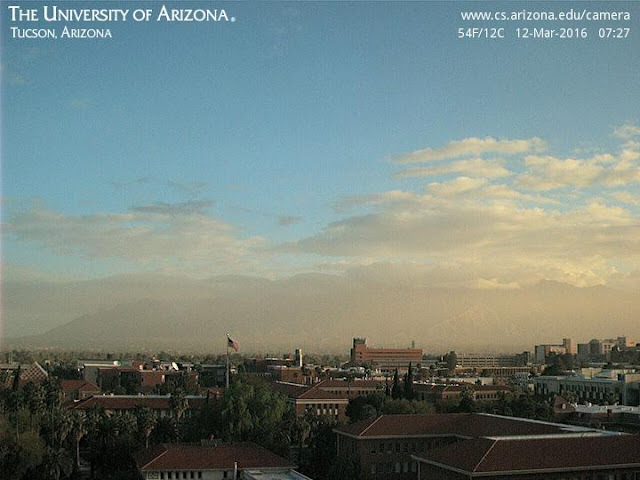 Main weather at sunrise was some suspended dust in the air, as per above view of Catalinas. When the front passed through Yuma last evening, the observations there (around 9:00 pm MST) indicated gusts to 40 mph with visibility down to a mile. That dust is now with us here in the Tucson area. 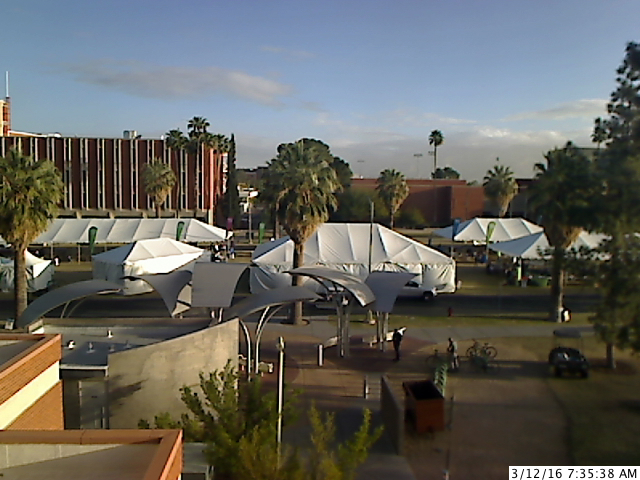 Meanwhile, the tents are up in the University Mall (below) and prospects are good for a nice Book Festival weekend.